PLOT The critters of the gaming app Angry Birds come to animated life. BOTTOM LINE Somewhere between movie and commercial, but mostly harmless and occasionally fun. Once upon a time, there was an island of birds whose eggs were stolen by little green pigs. Because the birds could not fly, they used a giant slingshot to launch themselves at the piggies. Some of the birds even exploded upon impact! After a great battle, the birds conquered the pigs, rescued their eggs and lived happily ever after. 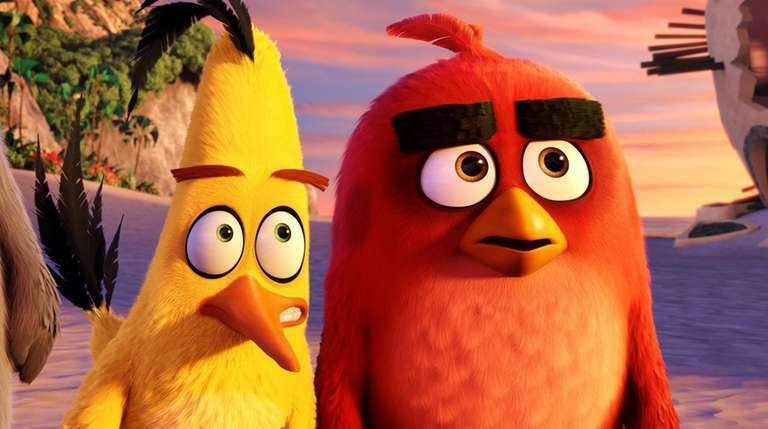 That’s the completely nonsensical story of “The Angry Birds Movie,” and there are two kinds of people who probably won’t quibble with it: adults addicted to the mobile gaming app Angry Birds, upon which this movie is based, and children too young to quibble with anything. Others may find that “The Angry Birds Movie” hovers somewhere between half-baked fairy tale and full-on advertisement, though in the end it’s mostly harmless and occasionally fun. The movie’s hero is Red, a kind of squat cardinal with distinctively bushy eyebrows and the sardonic voice of Jason Sudeikis. He’s a social outcast who’s been sentenced to anger-management class with three other miscreants: the manic Chuck (Josh Gad), the massive Terence (Sean Penn, grumbling wordlessly) and the literally explosive Bomb (Danny McBride). When those green piggies come to visit, led by the glad-handing Leonard (an excellent Bill Hader), only Red and his furious friends can see through their friendly act. It’s rather refreshing to see anger and distrust extolled as virtues in a children’s movie. In a grown-up version of this story, Red would be the raving conspiracy theorist who turns out to be right, and we can’t help but simmer along with him as the piggies hoodwink the island’s other birdbrains. When every precious egg on the island vanishes, Red leads the charge to get them back. The movie’s story, by John Cohen, is pretty thin gruel, but Jon Vitti’s smart-aleck script can be quite funny, and the brightly colored animation is appealing. (Fergal Reilly and Clay Kaytis are the film’s directors.) The voice cast, including Peter Dinklage as the washed-up hero Mighty Eagle, is also fine even if females are in oddly short supply. In all, “The Angry Birds Movie” is a lot like the game: not thematically rich or emotionally resonant, but it’ll pass the time.